The limited edition 25th anniversary Mazda MX-5. 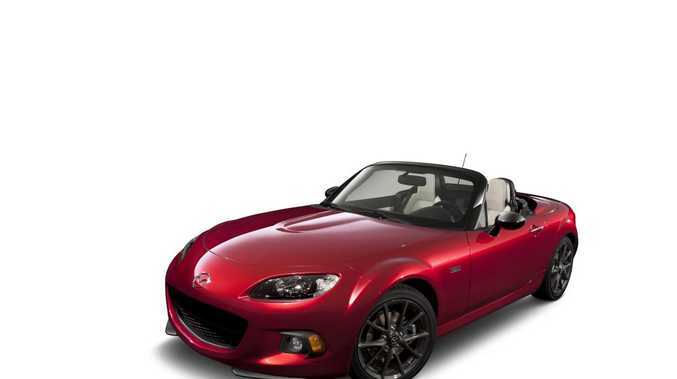 FORTY limited edition 25th anniversary Mazda MX-5s have arrived and are on sale. Since being unveiled at the New York International Auto Show in April, there has been a great deal of interest around the globe with the car selling out in just a few minutes in the USA and Japan. Australian MX-5 fans have been just as keen with local Mazda dealers having already reserved 13 cars for customers ahead of the official sales start of 10am today. Only 1000 have been produced worldwide. Mazda Australia anticipates a rush for the remaining limited edition models, which will be offered first to those that have registered interest in the car. Australia's allocation of 40 limited edition 25th Anniversary MX-5s is made up of 24 with manual transmission and 16 with automatic. In addition, each car comes with a complimentary limited edition MX-5 branded his and hers Tourneau commemorative watch set. Complementing the styling of the MX-5, each Tourneau watch is made of surgical quality stainless steel, and has a genuine sapphire crystal face and a black leather strap with red stitching. Featuring a 25th anniversary badge with serial number, the special edition MX-5 is available in the "Soul Red" metallic paint for the first time and comes with black painted A-pillars, door mirrors and retractable roof. Inside there is off-white leather upholstery and door trim, and a black leather arm rest, steering wheel and shift knob are highlighted with red stitching. In addition it comes with a red decoration panel and stainless steel scuff plates (with the 25th anniversary logo). Since its launch in 1989, more than 940,000 MX-5s have been sold globally earning a place in the Guinness book of world records as the world's most popular two-seater open-top sports car.